Mr Melvin Andrews, a pony who made headlines when bought by a well-meaning girl online and delivered to her grandmother’s backyard, is ready to start the next chapter in his colourful life. Melvin, as he is known, is now ready for rehoming, according to his caregivers with the British-based charity World Horse Welfare. Piebald Melvin, who stands at 10 hands, has been transformed from a straggly youngster into a fine-looking young man. He hit the headlines in May. It emerged that a kind-hearted British girl had come across him on an online free ads site. The ad said that the pony would be euthanised if no-one wanted him. She said she would take him and gave her grandmother’s address in Stoke-on Trent for delivery. Next thing, a man came along and left the pony there with no words of advice, leaving behind a confused pony and a shocked grandmother. The homeowner, unsure what to do with the pony, contacted World Horse Welfare. 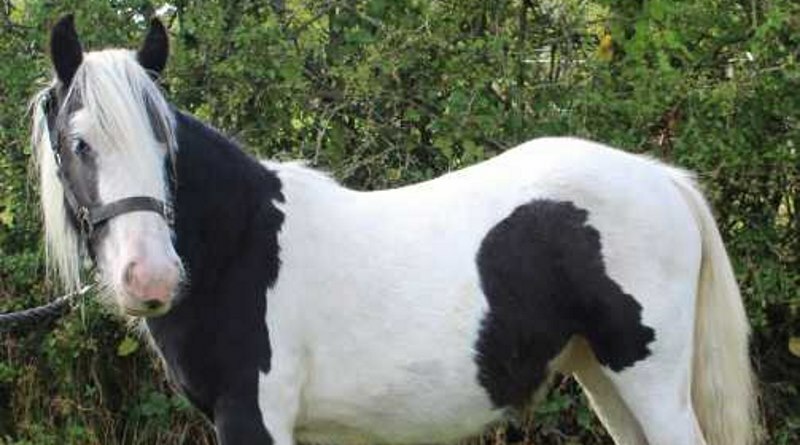 Wanting the pony to be assessed urgently, the charity’s field officer, Rachel Andrews, asked RSPCA Inspector Charlotte Melvin, who was closer to the site, to attend. “We don’t know where this poor pony came from but he clearly was not treated well before being abandoned,” Charlotte said. Melvin was described at the time as being skinny and covered in mites. He was taken to World Horse Welfare’s Penny Farm Rescue and Rehoming Centre for treatment and rehabilitation. Melvin, whose full name is an amalgamation of the surnames of the officers involved in his case, has now been named as this week’s adoption star by the charity. A straggly Mr Melvin Andrews after being taken into care. World Horse Welfare says Melvin has proven himself to be a friendly, cheeky little pony, who loves a good grooming session and gets on really well with others. “He’s now ready to find a home with a rehomer who has experience of handling youngsters and can continue his education,” a spokesperson said. Melvin, aged only 1, is said to mix well with mares and geldings, is easy to catch, and is well-behaved when having his feet trimmed. Learn more about Melvin here.